With Father’s Day right around the corner, we wanted to inform you about some great new products from Fair Trade Certified and sustainable brand, Oliberté. They recently launched some new gear product that is perfect for the active and/or city dad. The new Dobra backpack is perfect for any adventure and includes a spot for a laptop, has adjustable straps, and is made of Premium Ethiopian leather. 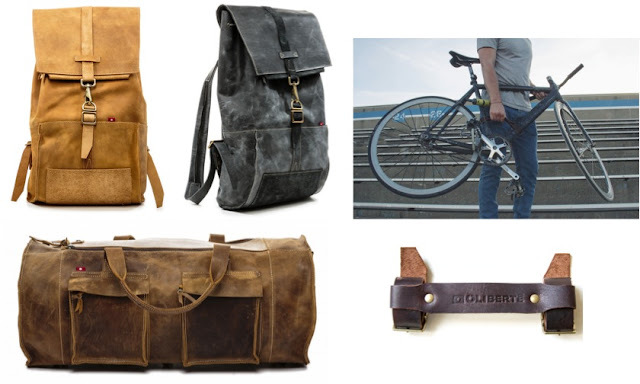 Additionally, the Cybandi bike strap is a wonderful gift for the dad who likes to bike and be stylish. Oliberté is a sustainable brand that’s main mission is to create jobs for those less fortunate in Sub-Saharan Africa. They create footwear and gear that is meant to last a lifetime, and is perfect to celebrate that special Dad that loves a great cause! Pictured (clockwise): Sogal in Rustic Brown Pullup, $105.00; Lomayo in Camel Pullup, $125.00; Gorilla Wax, $15.00 (Oliberte’s branded waterproofing wax); Zabilo in Rustic Brown Pullup, $110.00; Adibo in Brown/Yellow Pullup, $140.00. Shop for above and more at the Oliberté website.